Inspecting, testing, and maintaining standards for standpipe system performance include a static pressure test and a dynamic flow test. ITM standards require standpipe system performance testing at five-year intervals. Standpipe testing requirements include a static pressure test and a dynamic flow test. An understanding of the standpipe system configuration and the date of design is necessary in order to perform a flow test properly. Be sure to check hose valve position on dry standpipes before applying water. Hydrostatic pressure testing of standpipe systems is specified to be a minimum of 200 psi for two hours, or 50 psi above the design pressure if it is above 150 psi. This requirement does not apply to combined sprinkler/standpipe systems, which should not be over-pressurized. Test results are pass or fail. Failure will be obvious and usually results in unwanted water inside your facility. Flow testing of standpipe systems is more involved and as a result is often not performed properly or according to ITM standards. Proper standpipe system flow testing involves multiple fire hoses and thousands of gallons of water. Proper flow test results for a standpipe system test will indicate both the flow and residual pressure at the two remote hose connections, plus the test flow from all other standpipe up to the maximum flow required by design according to NFPA-14. Unless you are testing a horizontal standpipe system, the hydraulically remote connection is going to be on or near the roof, and a flow of 500 gpm is required from two hose connections there. Standpipe systems designed prior to 1993 require a residual pressure of 65 psig at a pressure gage located at the same location. Newer Class I and Class III standpipe systems require a residual pressure of 100 psig. Each additional standpipe is required to simultaneously flow an additional 250 gpm, until the total system demand (as designed) is reached. Flow from additional standpipes may be from a bottom hose outlet. Depending upon the design criteria of the standpipe system, there will be two hoses on the roof and as many as three hoses discharging at grade. As one can imagine, conducting a proper standpipe system flow test requires a well-coordinated effort. If uncertain about design flow, count the number of connected standpipes. NFPA-14 requires fully-sprinklered facilities to flow 500 gpm at the two remote hose connections, and 250 gpm from each additional standpipe up to a maximum flow of 1000 gpm. 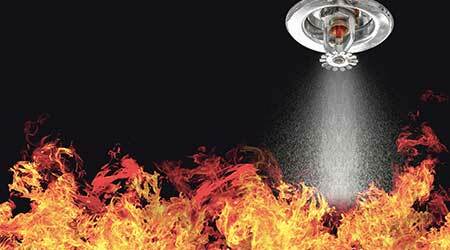 For partially-sprinklered facilities, the same approach is used up to a maximum flow of 1250 gpm. A correct standpipe system flow test report will indicate flow and residual pressure at the remote hose connections, and the simultaneous flows at each additional standpipe. However, the latter component is often neglected. It is important to understand that residual pressure will drop as the test flow increases. This means that if the residual pressure recorded during the test is marginally close to the minimum requirement and additional standpipes were not flowed, then test results may actually fail at design flow. This is significant, particularly on automatic standpipe systems. If your facility has an automatic standpipe system and is expanding to include anywhere from a second to fourth standpipe, then the size of the fire pump and backup power source must be evaluated.